LANDOVER, Md. 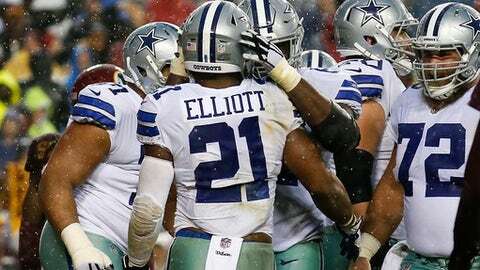 (AP) After letting the ball slip out of his hands on his first carry, Ekeziel Elliott was determined not to let his Dallas Cowboys teammates down again. Playing in a driving rainstorm that made it difficult to hold onto the ball, let alone throw it, Dak Prescott completed 14 of his 22 passes for 143 yards as Dallas (4-3) heeded the message on Elliott’s cleats to ”Feed Zeke.” With another hearing on his NFL suspension coming Monday, Elliott carried the ball 33 times, scored twice for the second consecutive game and surpassed 100 yards for the third time in a row. The Cowboys took full advantage of the Redskins’ bevy of injuries along the offensive line, sacking Cousins four times. Washington was without starting left tackle Trent Williams, center Spencer Long and right guard Brandon Scherff because of knee injuries and had two rookies making their NFL debuts – Chase Roullier at center and Tyler Catalina at right guard. ”The D-line has done a great job getting a lot of pressure: strip sacks, making plays,” Dallas linebacker Sean Lee said.